We've tracked down the latest prices on the new Google Home Hub, as well as the Google Home and Home Mini. Google Home prices fall on multiple occasions throughout the year on a range of its devices. That's what our dedicated price comparison technology is here to help you with. 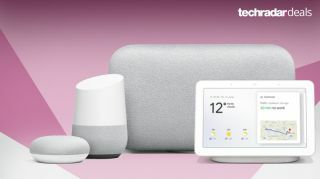 You're at the best (constantly updated) page to find the latest Google Home, Google Home Mini, Google Home Hub and Google Home Max deals. The Google Home family of smart speakers are amongst the most popular smart speakers on the market that tap into the convenience of voice control. And don't tell Alexa, but Google Assistant has proved to be considerably smarter at answering our requests. The Google Home and Google Home Mini are roughly on a par with the Amazon Echo range in terms of audio quality for music, but the newer Google Home Max frankly thrashes any of Amazon's Echo speakers for music fans that want to feel every beat. After you save on your new smart speaker, getting going with it is as simple as a voice command. All you need to do is say 'Ok Google' and ask your Google Home any question you like. Google Assistant uses the enormously powerful Google search engine to bring you the answer. More features and apps are being added all the time, but right now you can stream music from Google Play, Spotify, Tunein or your phone. There are smart home tech features to pair it with too, so watch in awe as you smart lights and thermostats are told what to do. Even the basic features prove incredibly handy, such as adding items to shopping and to-do lists, or setting alarms – finally, no more burnt pizza! The standard Google Home was the first smart speaker Google released. It costs a fair bit more than the Home Mini, but the more powerful speaker can be worth it if you want to play louder music. It's a great middle option between the choice of three speakers and considerably cheaper than the high-end Google Home Max. So, how much is the original Google Home? Prices started around the $129 / £129 mark, but retailers are slowly getting more competitive nowadays. We're seeing more discounts, or bundles, sometimes including a Chromecast dongle for free. The Google Home Mini is a smaller cheaper version of Google Home, first unveiled in 2017. Instead of a pricey £129/$129, like its bigger older brother, you pay $49 in the US and £49 in the UK for the Home Mini. Naturally, the Google Home Mini comes with Google Assistant, meaning you ask it questions by simply starting with, "Ok, Google." And with the power of Google search engine behind it and now a super low price to match, Alexa's time may be up. Color options include chalk (grey), charcoal (black) coral (pink) and the newest entry is mint (light green). At such a cheap price point, you may be tempted to get more than one, especially for family homes as a new Broadcast app allows you to talk to any Google Home device in the house. Google Home Mini deals have been strong of late as Google is keen to catch up to the Amazon Echo Dot sales, so you'll rarely have to pay the full RRP. Ok, so you're after some serious boom for the tunes? Then you'll want to take a look at the monster-sized Google Home Max. This large-speaker houses two 4.5-inch woofers for high-fidelity music playback along with the Google Assistant tech that's proved so popular in the Google Home range of smart speakers. Technically, this speaker is what we'd call super smart as it'll adjust its music playback automatically depending on room-size and placement. The microphone has been improved too and is more than capable of picking up your requests from the other side of the room even with music blaring out at significant volume. The Google Home Max prices tend to match the name to with a $399/£399 pricetag. It's been out for a while in the US, but the Max only arrived on UK shores in August 2018 and it appears to be a John Lewis exclusive for now, unless you import one from the US via eBay. We've been waiting a while for a screen on one of Google's smart speakers and late in 2018 we finally got one with the Google Home Hub. With a RRP of just $149 / £139 / AU$219, the Home Hub is much cheaper than the newest version of the Amazon Echo Show. The Home Hub naturally supports a huge range of smart home products like Hue bulbs, Nest thermostats and so on. Unlike the Amazon Echo Show, you're getting full YouTube support, which is great for watching music video, trailers, cooking videos, how to content and so on - a huge advantage over the rival device. We frequently find the voice-activated Google Assistant outperforms Amazon's Alexa at pretty much every turn too. The Home Hub doesn't have a camera built in, so you can't use it for video calls. If that's something you really want, we've rounded up the latest Amazon Echo Show prices for you too. What are Google Home bases? The bottom part of the original Google Home speaker can be swapped out for different 'bases' to replace the default grey one. They're not cheap though and the official ones are only available from the Google Store at the time of writing. Fabric bases are the cheapest at $20/£18 and come in Mango (orange), Marine (green) and Violet. Metal bases are $40/£36 and come in Carbon (black), Copper and Snow (slightly grey). We might just have to splash out for that Violet one though. We've seen some third-party sales and knock-offs, mainly leather-style ones, at Amazon and eBay, but nothing particularly tempting so far and the prices aren't that much cheaper either.